Designed by Los Angeles based sculptor Peter Mayor, and influenced by the dynamic sculptures of modern 20th Century artists, ShapeScapeS inspires anyone from 6-96 to create an endless array of fantastic structures. With over 90 organic shapes in seven different colors, budding artists get to dreamscape and shapescape any which way they want. Thoroughly versatile, easy to pull apart and reassemble, ShapeScapeS allows one to create anew, again and again. 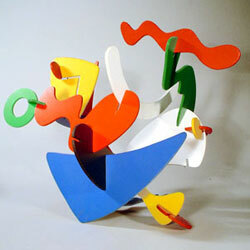 The sculptures can be easily recognizable – a person, an animal, for example - or some unique, abstract construction. 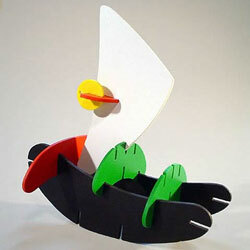 In any case, all ShapeScapeS sculptures can be proudly displayed on tables, walls, or even hung as mobiles. Our mission is to produce educational, fun, artistic, interactive toys that emphasize the elements of color, form and design. These toys allow a child's unique artistic abilities to blossom while heightening their intuitive thinking and spatial skills. We offer innovative, stimulating and aesthetic solutions to the age-old problem of parents with small children - finding toys that broaden minds while providing fun. Besides creating hours of imaginative play for children and families, our toys have tremendous potential for educational and therapeutic use, and can be utilized as a tool for creative corporate team-building. With ShapeScapeS, the company put forth an exciting challenge for all children, "What Shape Is Your Imagination?" Children and adults alike have answered the call by "ShapeScaping" their way into endless imaginative creations. Now, we have new plans for products and have expanded our mission: "To liberate the world... one child at a time!" Click here to see some of the products ShapeScapeS has shared with ToyDirectory and TDmonthly Magazine.